Don't be fooled by the perfection it is a hell of a lot bigger than it looks. 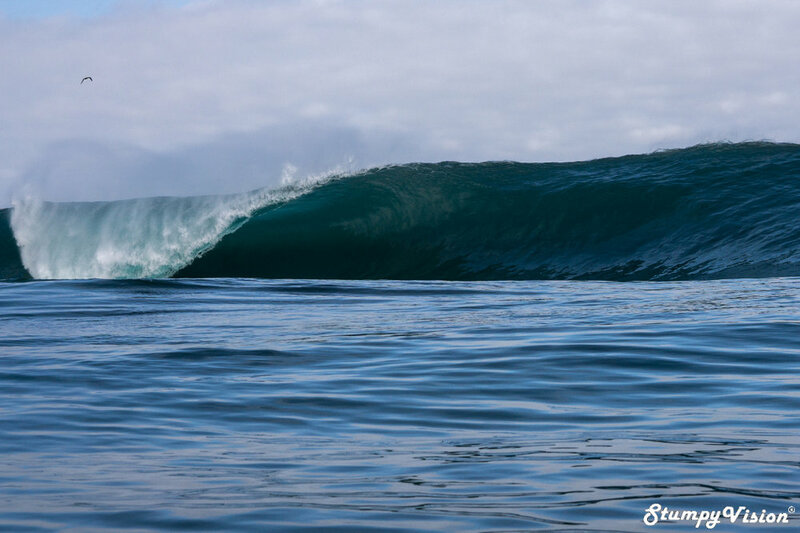 Chile, an Overlooked Mecca for Big Wave Surfing? 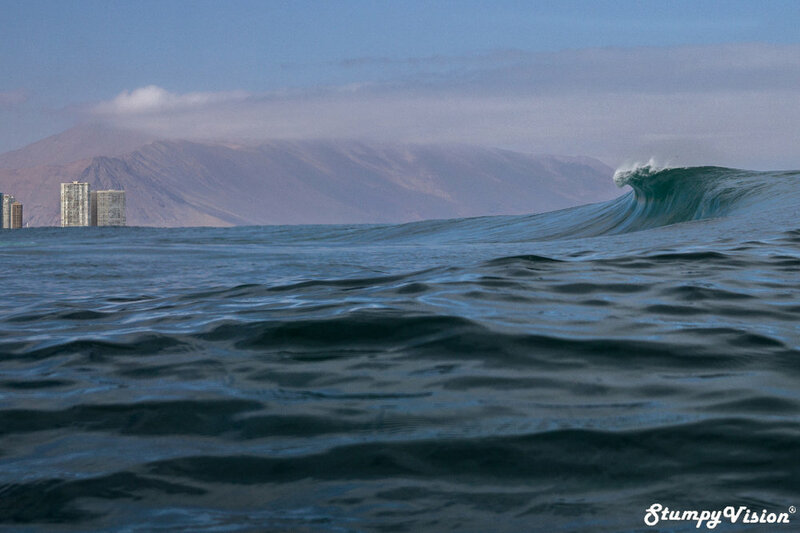 While the Northern surf towns of Antofagasta, Iquique and Arica suffer no shortage of heavy big waves spots I firmly believe that the Chilean Teahupoʻo well and truly trumps them all. The Chilean Teahupoʻo, in fact goes by another name but in order to respect it's relatively underground nature and limited crowd levels I will hereby refrain from naming it or disclosing it's exact location although this spot is no secret by any account. Perhaps this widow-maker of a wave is largely overlooked as it is greatly overshadowed by it's more famous Southern cousin Punta de Lobos. Located in the sleepy coastal town of Pichilemu in Chile's frigid deep South Punta de Lobos is Chile's most famous big wave spot....well for the time being anyway. While there is no doubting that the famed big wave spot of Punta de Lobos is more than capable of handling any of the giant and powerful swell that the Pacific Ocean is more than willing to throw at it I still believe that it is light years behind in regards to sheer heaviness and size of barrels that this Teahupoʻo impersonator dishes up on a regular basis. Others may argue that El Gringo/Floppos in Arica maybe just as heavy if not heavier than this wave but having experienced both waves first hand up close and personal I believe that El Gringo doesn't quite measure up when you take into consideration the thickness of the lip and unpredictable nature of this wave. You can read all about my time in Arica here. Well what about the rest of South America? I have recently stumbled apon footage of another big wave spot located in the most Southern depths of Brasil that looks like it has the potential to claim the title of the heaviest wave in South America. However, I do doubt that this wave would have the size and consistency of swell required to break on a regular basis but perhaps this wave could provide me with yet another excuse to return to Brasil for further exploration. The raw and rugged Chilean desert coast. My First Hand Encounter with the Beast. I spent close to a month in this small undisclosed coastal town in a hope that I would score this spot firing so I could capture the raw unforgiving nature of the beast! Unfortunately much of my stay was plagued by bad winds and junky swell conditions. While I still had more than my fair share of fun and pumping days surfing in the region I was yet to luck into a truly epic day worthy of documentation. In the meantime two of my closest friends Chad (Chad Barlow Photography) and Matt had recently flown in from the States to join me for a week of surfing/partying and things were soon to get very crazy indeed. The immediate surf forecast remained poor so I had all but written off my chances of scoring this amazing wave. Being rather long in the tooth these days I am not one to overly indulge in the party scene but as I had pretty much given up all hope on scoring this spot (a very large swell and heavy onshore winds were predicted for the next day) I fatefully decided that it was time to throw all caution to the wind and let loose with a big night out. Why not? I deserved it! With the throwing in of the towel I proceeded to have one of my biggest and craziest all night benders of my entire two years of my travel through the Latin Americas. I could go into much, much more vivid detail on the extreme levels of drunken debauchery and shenanigans that went down that night but as they say what goes on tour stays on tour and you won't hear a further peep out of me. 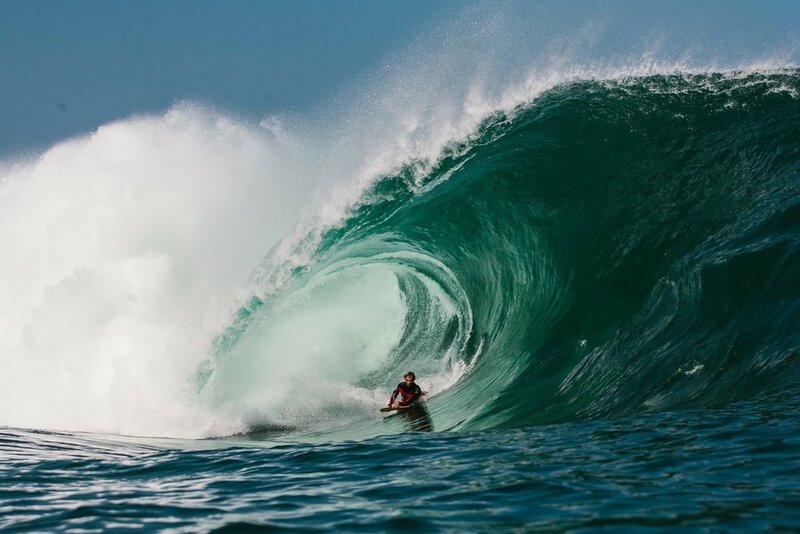 Australian Michael Novy charging hard a few years back. Photo by legendary New Zealand photographer Chris Garden. Surveying the arena. Photo by Chad Barlow. I must admit that I came somewhat close to thoroughly crapping inside my wetsuit when I first arrived at the check point. I was to be greeted by thumping barrels almost as thick as they were high and the sets often reaching the triple overhead range. Was I really going to take this highly dangerous wave on solo and half drunk? Hell yeah I was! Only one lonely Pelican for company. Michael Novy in the sweet spot. Photo courtesy of Chris Garden. Novy is not one to hold back. Photo by Chris Garden. An unidentified local attempts to escape the underworld. Photo courtesy of Chris Garden. The gods say no. The end bowl is set to claim another victim. Photo courtesy of Chris Garden. Keen to negiotate the steps as you exit the barrel of your life? This pinchy end section is more than enough to ruin anyones day. This is definitely a Teahupoʻo esque wave. What makes this wave all the more dangerous is its highly unpredictable nature. More often than not waves would march in and line up perfectly looking to all the world like it was about to offer up the mostly perfectly make-able barrel section. However, once you had successfully negotiated the acid drop and somehow managed to set a clean line through the first heaving barrel section you would then find yourself at the mercy of the gods. Would the gods choose in your favour and allow you to make it through the final surging, wedging and almost dry end section? 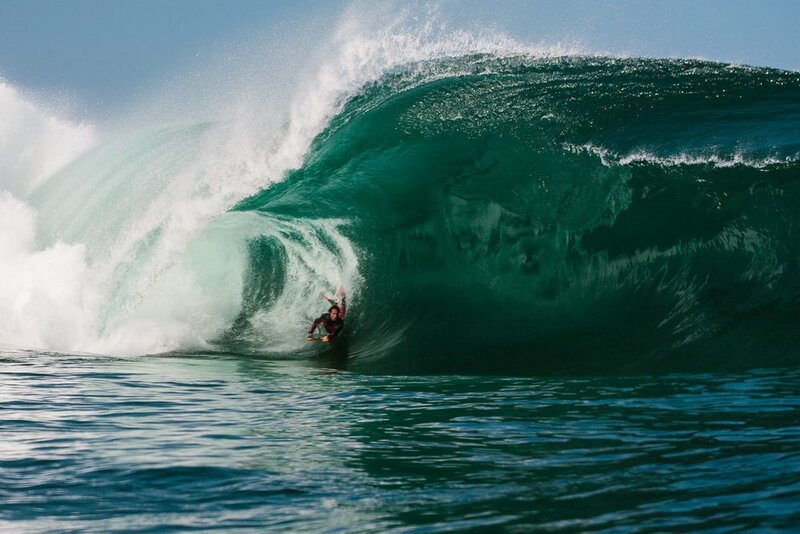 If luck was with you then you would most likely thread your way through one of the best and heaviest barrels of your life before flying into the safety of the channel to claim your glory. Yet if the gods did not hold you in their favour then you would most likely face the harsh realities of one of the worst wipe-outs of your life. 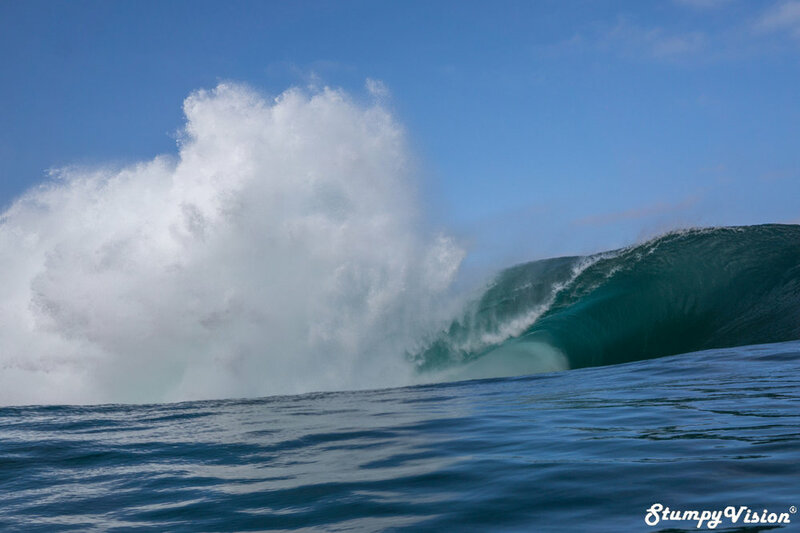 The ruthless end section would shut down, slamming and dragging you unmercifully across sharp unflinching reef. 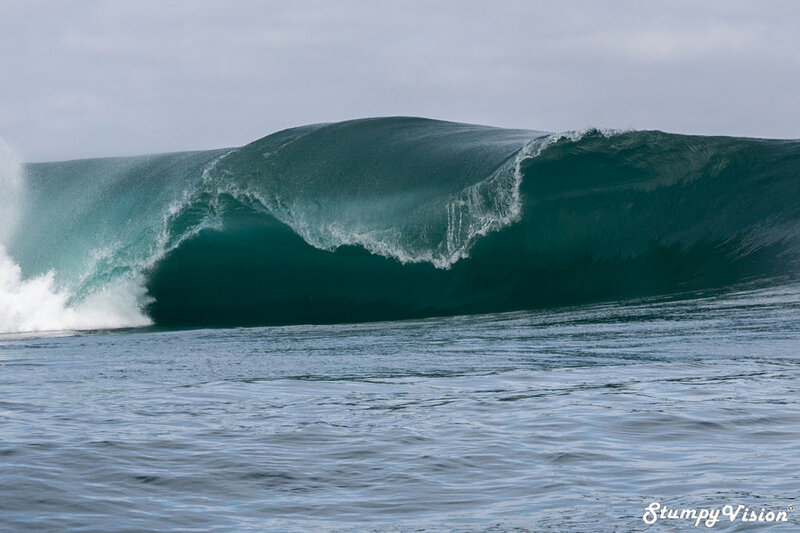 This end section is ridiculously unpredictable to say the least and I feel for anyone who has the misfortune of being eaten alive at the last moment straight after you have skillfully negotiated your way through one of the heaviest barrel sections of your life. Life can be horribly unfair sometimes. Nowhere to go, nowhere to hide. Welcome to cold unforgiving and unflinching Chile. This can be the reality of the situation when you are brave or perhaps crazy enough to challenge this wave in a round of Russian roulette. Careful wave selection is definitely a must here. Another shot from the sequence. The conditions were absolutely perfect on this amazing day and the only thing that was missing was fearless gladiators challenging the beast while I captured all of the carnage but I hope the Chris Garden's images help to paint a thorough picture for you. 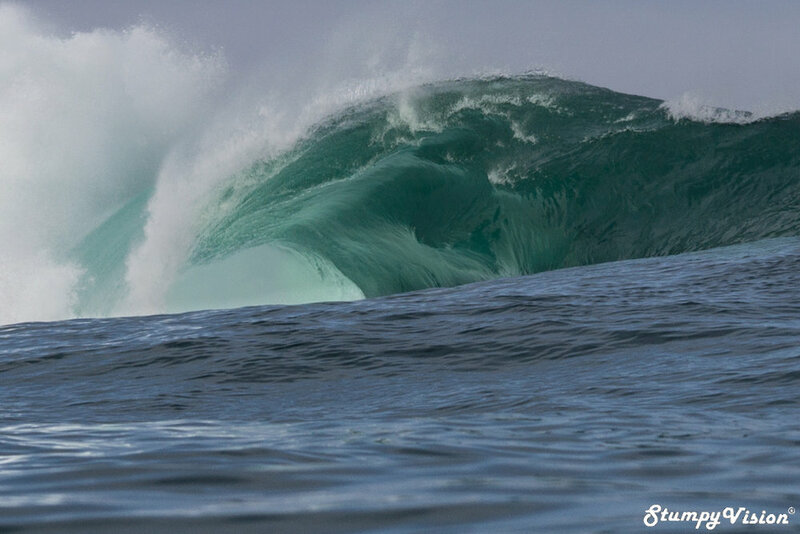 But is this really the heaviest wave in South America? Well until I witness something to the contrary I firmly believe so. While there where many sets in the triple overhead range this day I would love to see this wave breaking at a solid four-five times overhead to gain a true glimpse as to what this demon wave is truly capable of. I firmly believe that the Chilean Teahupoʻo could rank up there among some of the heaviest waves on the face of the planet today and I would not be surprised to see this wave emerge in the public eye for big wave surfing in the near future. Big wave surfing in Chile is well and truly primed to make it's mark on the wold stage at any moment now, just mark my words! Are you ready to tame the beast?